Update: Musk deleted his Tweets probably at the behest of Tesla legal but we screen-captured (below) because these types of things seem to happen with increasing frequency. 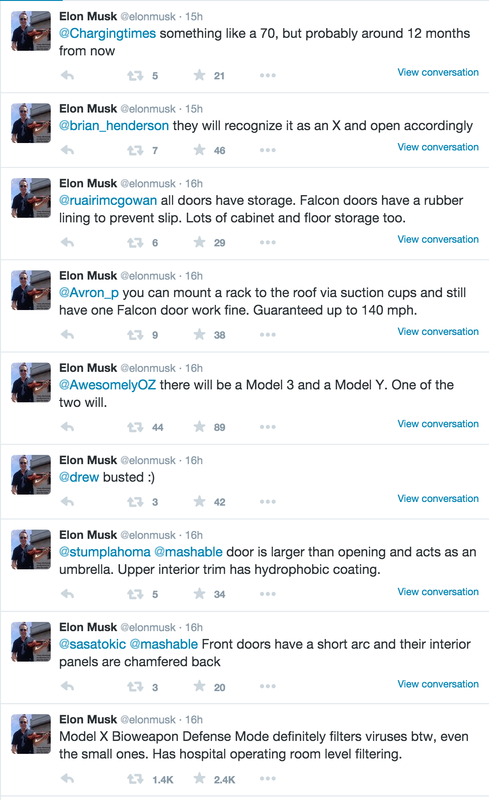 First, the Model X 70D is around a year out according to a reply. Also it might be a 75kWh battery or something similar if you consider Tesla’s always improving battery tech gets better by 5-10% per year. The Model X Falcon Wing doors will have rubber lining so things put in them won’t slip out when they open to 90 degrees (not for open cups of coffee!). Also Model X’s will recognize each other so when they park next to each other the doors don’t get in a fight over airspace. You can also still have a roof mount on the Model X on one side using suction cups on the windshield that goes up over the driver and use of only 1 door. (this doesn’t sound appealing btw). Musk says it is guaranteed to work to 140mph which must have been fun to test. I’d get a trailer for those kayaks. Perhaps those skis and bikes will fit in the back. @Avron_p you can mount a rack to the roof via suction cups and still have one Falcon door work fine. Guaranteed up to 140 mph. The air filters are hospital grade and will filter out even the smallest of viruses. Additionally, it will filter out the Harris Ranch supercharger’s surrounding smell. The Falcon Wing doors will act as an umbrella but the interior coating will still be water resistant (Californians and their little understanding of rain). @stumplahoma @mashable door is larger than opening and acts as an umbrella. Upper interior trim has hydrophobic coating. Musk also confirmed that there would be a model Y which we’ve heard is a smaller crossover based on the Model 3 platform. It will also have Falcon Wing doors.